Liyema Nxobo represented the country at the Zone 6 Championships in Namibia. He competed in tumbling and won bronze as individual and gold for the South African tumbling team. 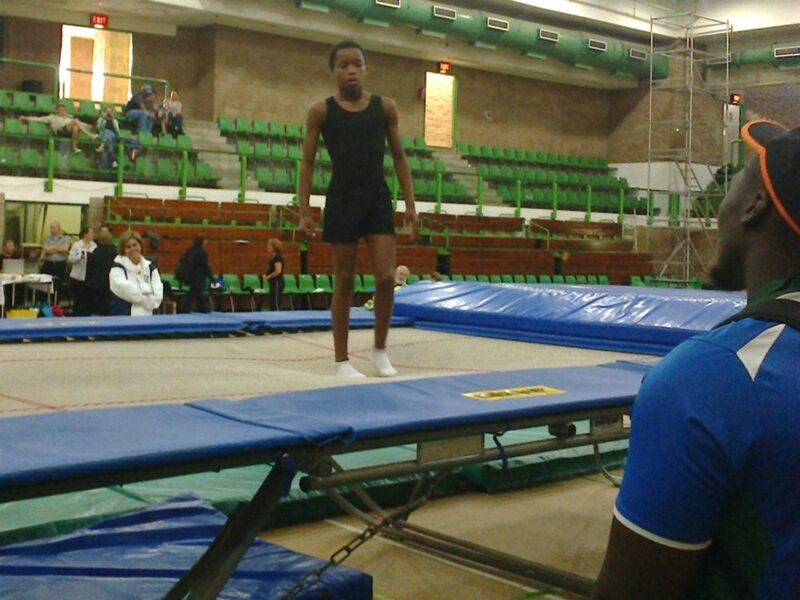 Liyema is the fourth Nemato gymnast representing South Africa. 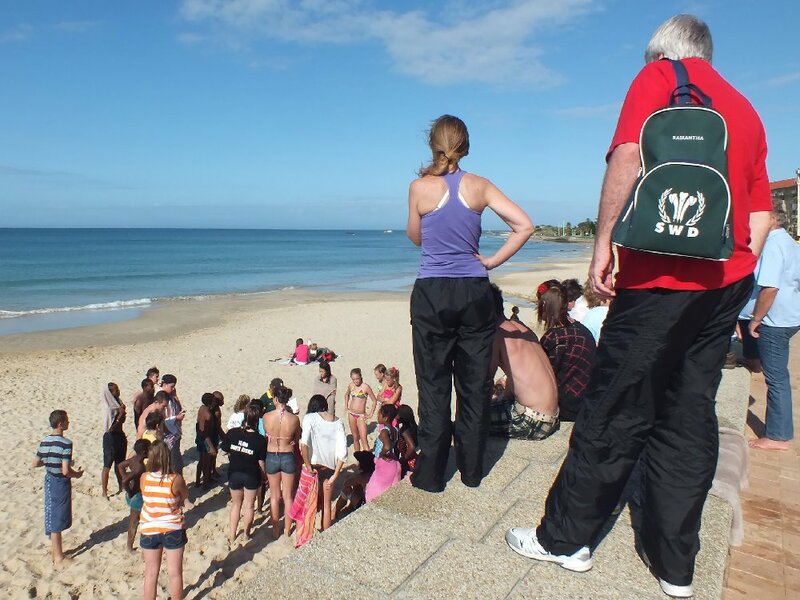 The last competition of the year was Mandy's Classic in Port Elizabeth. We went there with 22 gymnasts. 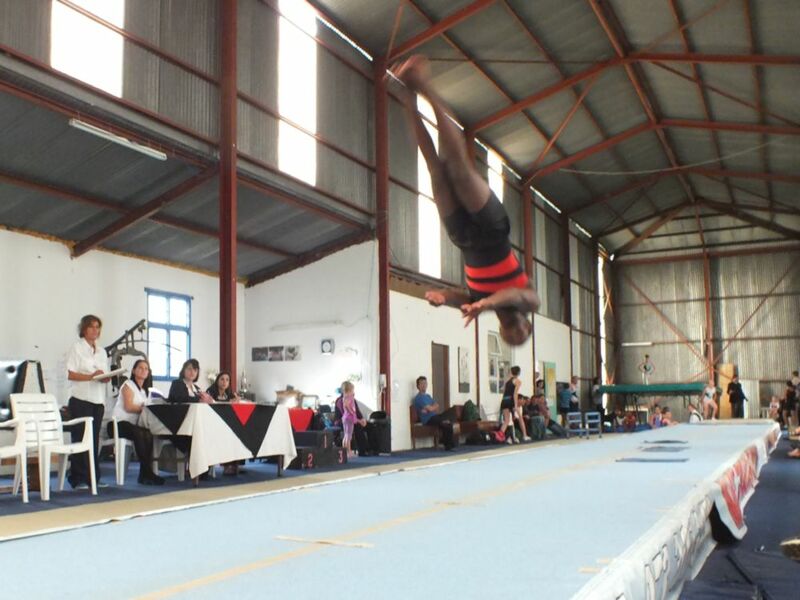 Liyema Nxobo stood out on the trampoline with the highest score of the competition. It was nice to jump on all the good apparatus, that we don't have at our club. Mandy's pool is great too! 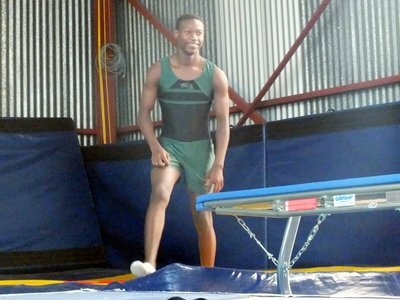 No other club had as many gymnasts selected for the Eastern Cape tumbling and trampoline team as Nemato: 22. The South Africa Gymnastics Games took place in Cape Town. 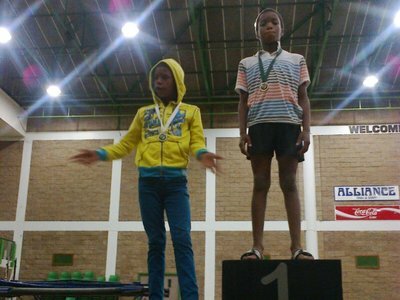 The highlights for Nemato were: silver on tumbling for Siphamandla Baku (age group 17/18), silver on double-mini trampoline for Khanyile Mbolekwa (age group 10 and under) and gold on double-mini trampoline for Onke Mangele (age group 13/14). Khanyile also jumped in the opening show. 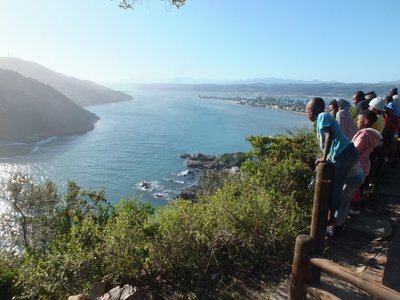 Besides the competition, we also did some sightseeing in Cape Town and on the way. 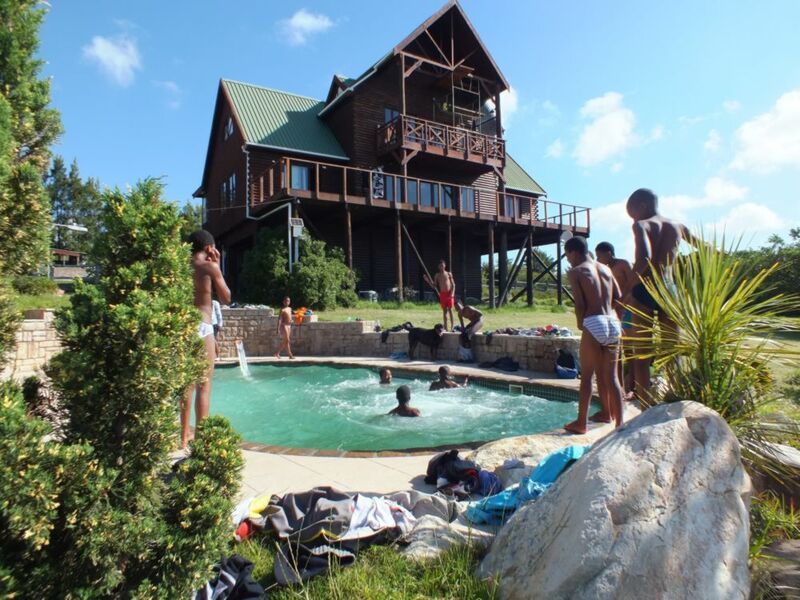 The Eastern Cape Academy of Sport invited ten of our gymnasts to a three day camp at Mandy's Gym in Port Elizabeth. 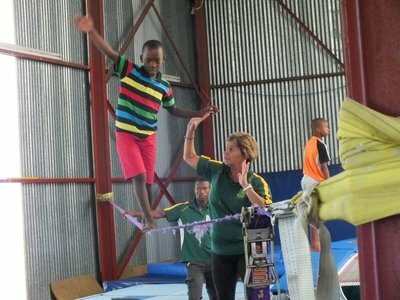 It was a good preparation for South African Gymnastics Games in Cape Town a few weeks later. 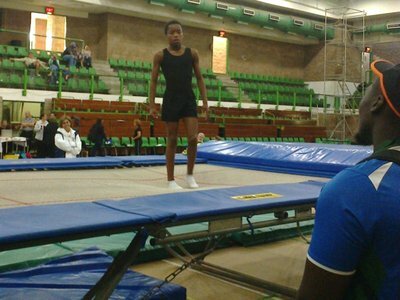 There was a third trials event to qualify for South African Gymnastics Games. 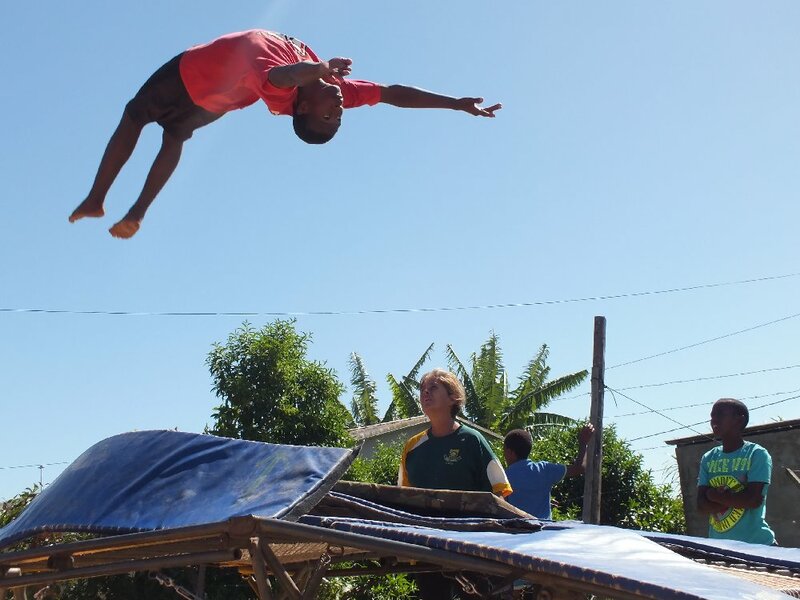 This took place because at Eastern Cape Champs there was no tumbling track. These extra trials were for the high levels tumbling (level 4 and up) and also for some top level double mini and euro trampoline. 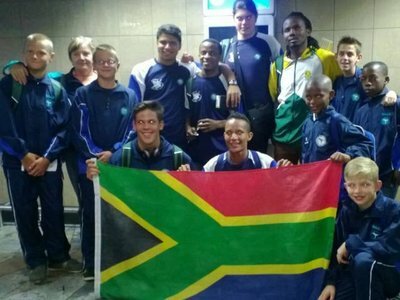 All Nemato participants in this event qualified for SA Games. 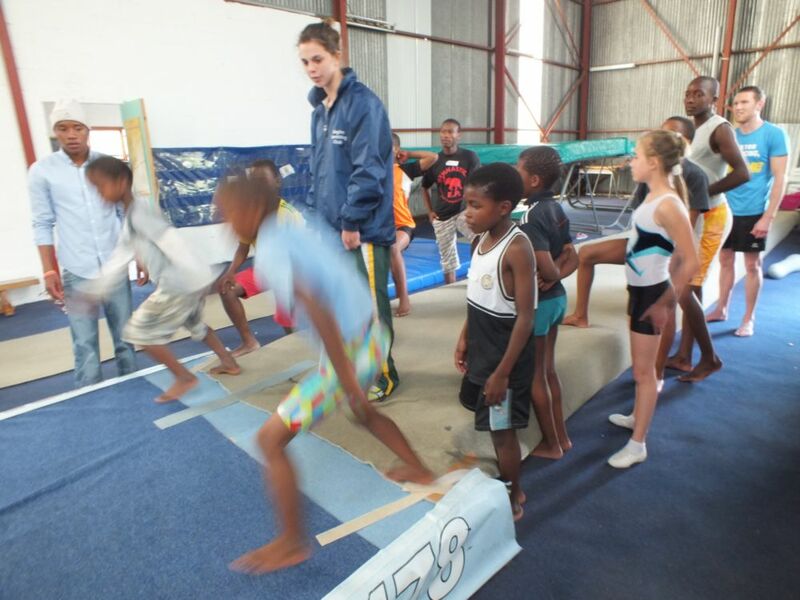 The provincial championships are also trials for the South African Gymnastic Games in Cape Town. 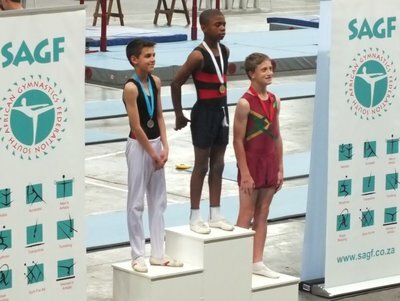 Nemato dominated many of the higher age groups and levels boys events, but the most impressive performance came from the young Nemato gymnast Khanyile Mbolekwa, who stole the show with beautiful routines on the trampoline. He was the only Eastern Cape gymnast jumping the highest level (five) in the boys age group 9 to 10. 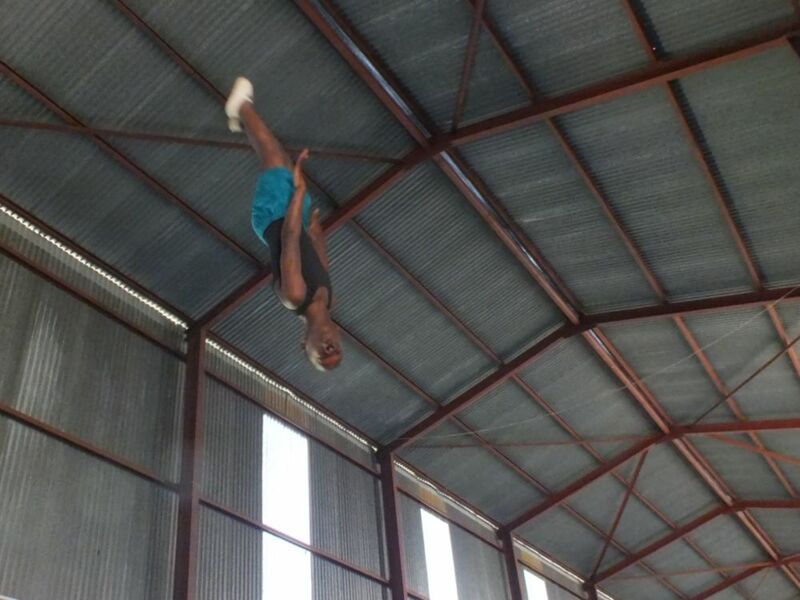 It's clear we have another gymnast who can go international. Thank you Stenden for transporting us! The first gymnastics competition of the season was Eastern Cape Trials. 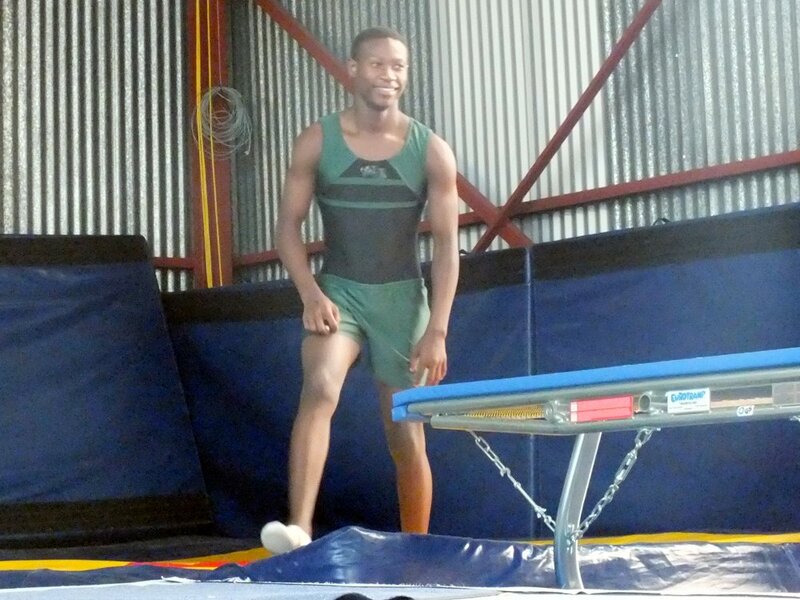 On Friday was the tumbling at Anderson's and on Saturday the trampoline at the Indoor Sports Centre in Uitenhage. We competed with a large group of 23 Nemato gymnasts. Our four top gymnasts were not there, they were at a tumbling competition in Johannesburg, but still, probably because two other strong clubs were not there, we dominated the higher levels boys gymnastics in the higher age groups. It was a nice event. Next time we'll even do better: we'll have a list will the jumps, so that we don't lose points for jumping wrong routines, and we'll be a bit more disciplined during sleeping hours. Watch out for Nemato at Eastern Cape Champs, we are going to be strong! 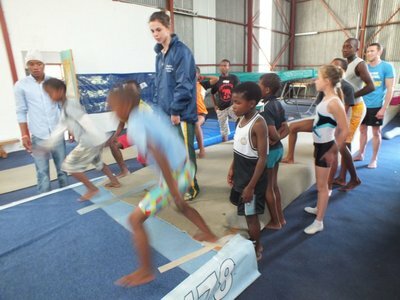 Mandy Zoonekynd, the top coach in Port Elizabeth who is coaching our best gymnasts, came to Port Alfred for a training session at our place. She was very impressed by the talent in our club and identified 18 gymnasts with international potential. 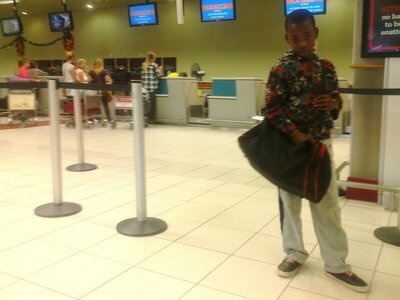 We'll try to get as many of them as possible to Port Elizabeth regularly for training sessions to develop their talent. 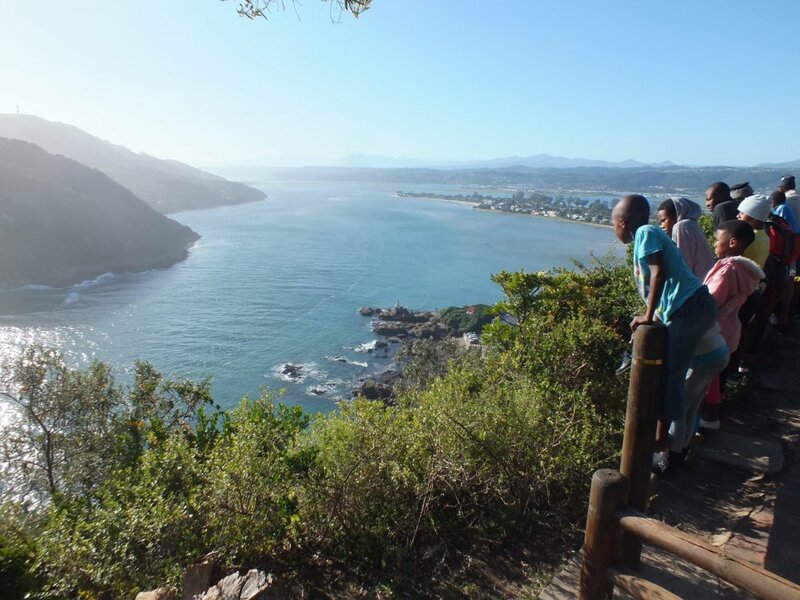 In early July the Indo Pacific Championships will take place in Sun City in South Africa. 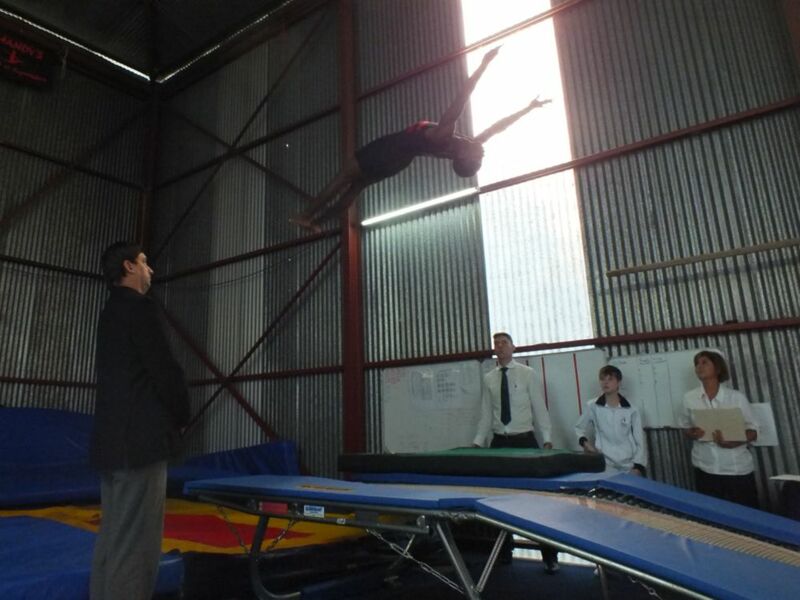 For this mayor international competition we took four gymnasts to trials in Port Elizabeth. 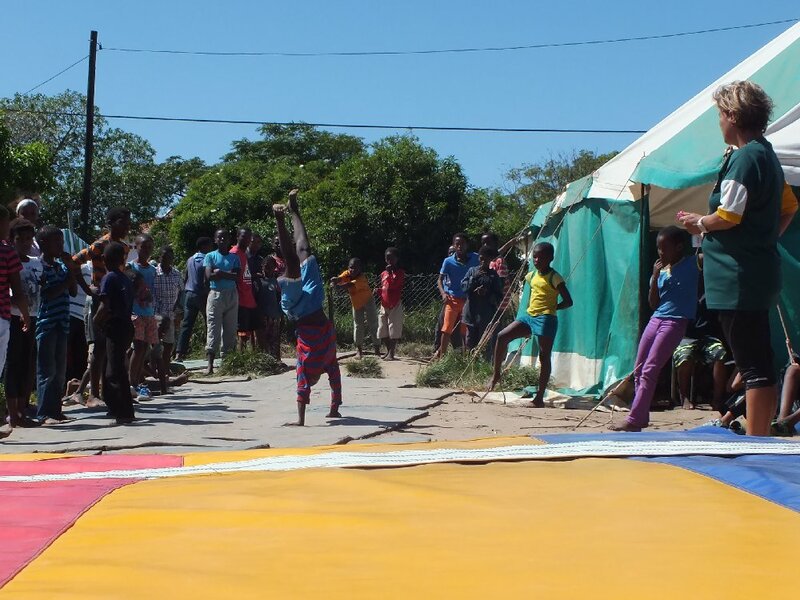 We are very proud that three Nemato gymnasts are selected: Siphamandla Baku (double mini-trampoline and tumbling), Siphokuhle Nyoka (double mini-trampoline) and Onke Mangele (euro trampoline and double mini trampoline). On Friday were the trials and	on Saturday the training session and team building on the beach. 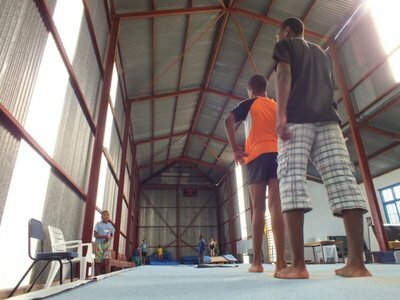 We started training sessions at Mandy's Gym in Port Elizabeth again to prepare our top gymnasts for the trials for African Champs. 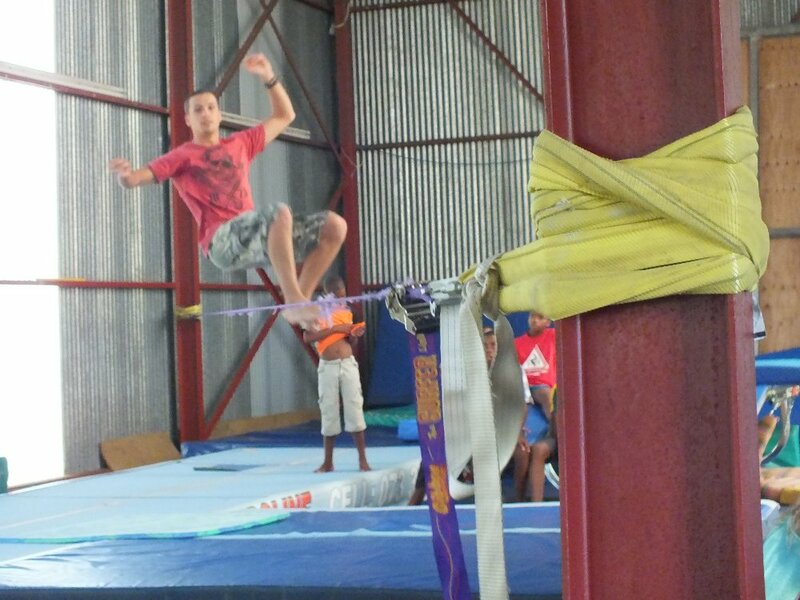 It was fun, as some slackline guys visited and did some great tricks on the line. Some of our guys were very keen to give it a try. Not easy!